I think a lot of people who eat granola make their own. Everyone develops a certain type they like and a lot of times it’s easier to make that type rather than buy it. Our family prefers the maple syrup sweetened variety of granola but we have a hard time finding any granola that doesn’t contain nuts — Papa is allergic — so making it is almost our only option. What follows is an adaptation of a Fine Cooking recipe where I’ve omitted the nuts. You of course can add them back in if you desire. Put all the dry ingredients in a large bowl and mix them well. In a measuring cup combine the liquid ingredients. 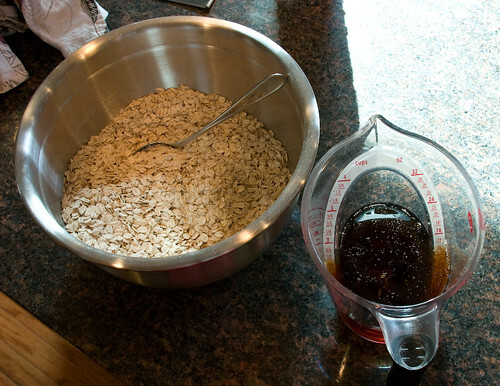 Pour the liquids into the dry ingredients and stir, stir, stir. Spray two rimmed baking sheets with non-stick spray — I use silicone mats and just spray the edges of the pan. 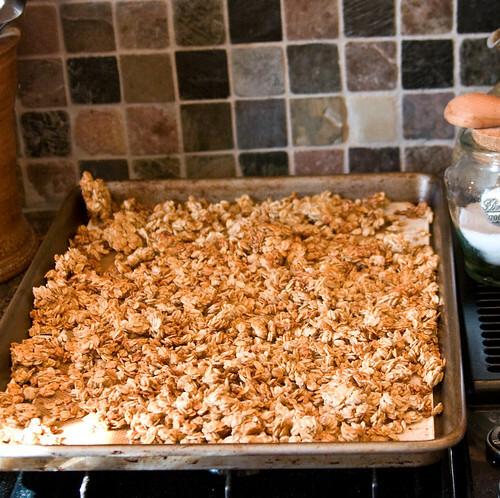 Divide the granola between the two pans and spread as thin as you can. Bake in the middle of the oven at 300′ F for 20 minutes. Stir and flip the clumps. Rotate the pans. Bake for 20 minutes more. Stir again. It may be ready now or it may need up to another 20 minutes. If you smell the slightest burnt smell get it out of the oven because nobody likes to eat burnt granola. Let it cool and it will harden/dry. Store it in an airtight container. If you like to add dried fruit you can add it (about 2 cups) after the baking but around here we prefer to add it as we eat it. 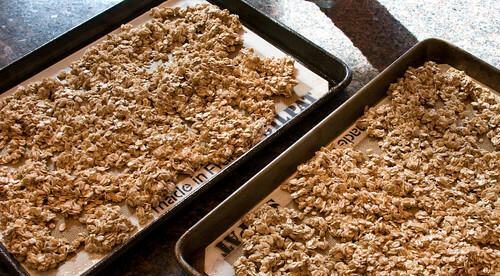 I love love love Granola from scratch. I can eat it all day long. It is so fresh and delish! Thanks for the reminder! What? You can make granola? I never thought of that before. I love granola, and it is sooo expensive. Man, what a moron I am. I am so going to try this, it looks easy enough! Thanks. Thanks for the recipe! I was just gathering supplies to make granola myself. I can’t wait to try this! I made a batch last week…I think I am close to perfecting it to my taste finally. does yours clump together? that’s the one thing mine is missing. One of these days. I have all the ingredients and I keep reading posts. One day – soon! I can just imagine the heavenly smell of it baking. We love granola here but I add applesauce to mine since they won’t eat raisins in it. Thanks so much for your “made from scratch” series. Such a great idea and your recipes look wonderful. 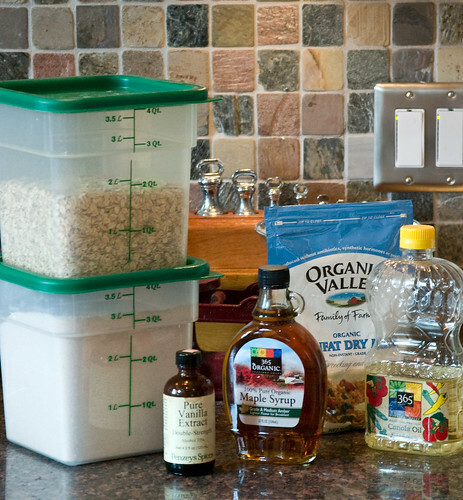 I love to make granola but I am still looking for a good clumping recipe for snacks. Does your recipe clump?